Welcome to the “Exclusion of Discrimination”! We are looking forward to meeting you in Bremen and to working with you in this international training course. To make this event a very successful and enjoyable experience for you and for us as well, we have compiled this information guide. Here you can find all important information needed for your preparation. 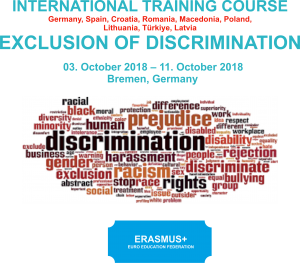 The main aim of the Exclusion of Discrimination training course is to empower and equip youth workers with the competences needed to fight discrimination and promote values and practices supporting the fight against it. This training course will bring youth workers and leaders from Spain (4), Croatia (5), Romania (4), Macedonia (4), Poland (5), Lithuania (5), Latvia (4), Turkey (5) and Germany together. How to prepare and what to bring? You may bring music, modern or traditional, that you want to play during the intercultural and other evenings. Bringing with you different games to be used during informal moments is welcomed! You are invited, but not obliged, to bring your computer or laptop. – Some gastronomic specialities (food and/or drinks) to share with others during Inspirational evening. – Have comfortable clothes, as we might be doing active stuff! – Shoes for inside. Since we would be staying inside most of the time, and it’s a really large house, you would need shoes for inside (slippers or clean shoes) the house. There is a policy of no “normal” shoes inside. It also helps us keep the place clean during our time there. – Bring your own towel. – Bed sheets you have to take with you. Please be prepared to present your organization during the project. For this, bring some information materials about your organization, photos and reports from former projects and other things which will help you to do so. As we have a lot of participating organizations, the presentation will be organized as an NGO fair, which means you will get time during the project to prepare a good old analogue poster…which also means there will be no time for individual Power Point presentations. Working language of this training course will be English. It is in the middle of nowhere. This means the group will stay to- gether at all There are no cafes, no discos, no restaurants, even no supermarket nearby. We will all get to know each other very well. It is important for the group energy and group dynamics. The rooms are going to be 2-5 beds per We are going to be from mixed nationalities, but from the same gender. We will be the only group in the It was important to us not to be bothered with other groups and other timetables and rules, so that is why we decided to come here where we would be alone. We would do workshops, make party, make events, cook and eat together, load the dis- hwasher, and make sure that the door is locked at night. We would make the rules together, we would respect the rules that we make. We have hired our own cooking and logistics team so they would prepare meals for us but also that nice and healthy food will be done for the people with food preferences – vegetarians, no pork and so We are not staying at a hotel, so don’t expect hotel environment. Everything will be up to us, meaning that everyone should help with something. Either is setting up the dining tables in order, loading or un- loading the dishwasher, or helping with the workshops places, or setting up the fireplace, or bringing wood for the fireplace, or just not littering and making a mess in the house. It is not allowed to come one day later or to leave one day before the designated dates. We can only reimburse tickets that are on/before 3rd and on/after 11th. Your task is to get to OHZ Garlstedt BW Logistikschule on 2nd of October. There is a direct Bus from Bremen Central station with number 660 in direction Hagen, which leaves once per two hours until 19.00. The venue is 0,7km away from the bus station. At the station someone will be waiting to walk you to the house. Osterholz-Scharmbeck (Train station) on 2nd of October. The venue is 12km away from the train station. Some of us will pick you up from the train station. For the return, we will organize on the same way once we have your de- parture times for the bus or trains from Osterholz-Scharmbeck. According to the rules from NA in Germany, is it acceptable to come/le- ave up to 4 days prior or after the project. Every flight that is more than this time limit would not be accepted by NA, and therefore we cannot reimburse it. However, when you want you can use these 7-8 days to tra- vel around the region. Bremen, Hamburg and Berlin are really beautiful cities that are worth seeing. Please note that we are not responsible for your travels before or after the project, so all costs for accommodation, food and travelling are going to be on your own expense. Before booking your travel arraignments, you have to send it to us to have them pre-approved. Only approved flights and routes will be reim- bursed. This means that you have to send us screenshot of your intended booking of flight. Within 24h we will reply you with confirmation that you can proceed with your booking or that you have to do some changes. You can fly to Bremen, Hamburg, Hannover, Berlin, Cologne, Frankfurt or Dortmund. It will take you 1.5-4h of trains or busses to reach Oster- holz-Scharmbeck. www.skyscanner.com, www.ebookers.com and www.kiwi.com are good online engines – when you book early. When you reach any of these towns or airports, you can take a train or bus to Osterholz-Scharmbeck. Please check your bus on www.flixbus.de to Bremen or trains on http://www.bahn.com/i/view/GBR/en/index.shtml. Please have in mind that when you want the cheapest possible train you should chose regional trains. When arriving in Hanover or Hamburg, there is a group ticket called Niedersachsen ticket for this region. 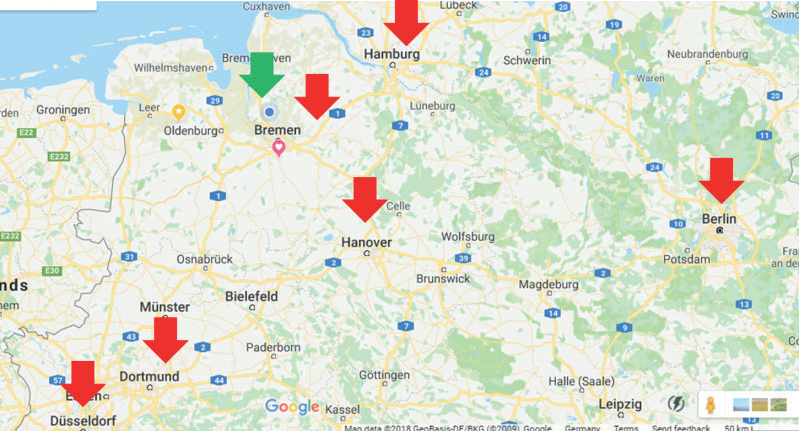 This means that the basic fare is 22€ for one, but 26 for 2, 30 for 3, 34 for 4 and 38 for 5 people travelling Between Hannover, Hamburg or Bremen(Osterholz-Scharm- beck is in Niedersachsen region). If you need any assistance with booking your flight or train, please contact us in timely manner and we will help to organize your trip since we have experience in finding the best and cheapest routes. Travel costs will be reimbursed according to the distance bands allowances from Erasmus+. The 100% of travel costs reimbursements are going to be made after the project. IMPORTANT! You must keep all travel receipts, such as boarding passes, train tickets, etc in ORIGINAL including tickets or vouchers you get from us and send them by post to us. So please keep all your tickets since it is not possible to reimburse tickets that were lost or misplaced. Note! We will not reimburse private taxi-hire or first class tickets. Be on time, if you miss your connection we cannot reimburse new tickets or tickets you did not use. The amount of money allowed doesn’t mean that you should spend it all, but that this is the maximum that can be reimbursed. We do not accept booking of flights and train tickets with travel agents. In extraordinary situation when booking yourself is not possible, travel agent booking can be allowed with sending us 2 other offers from other travel agents to compare the prices, upon which we can allow the booking. Health insurance is not provided by the organizers. All participants are required to purchase health insurance individually. Every participant is supposed to book their tickets not later than 3rd of September. Our experience has shown that people who don’t buy their tickets until then, there are most likely not going to participate and we cannot find participants as replacement on short notice few days before the start. Therefore, please book your tickets and send them to us. Boarding passes, flight bookings, train tickets etc. as proof oftravel. 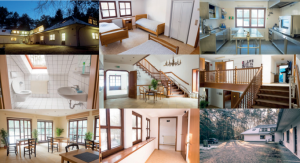 Accommodation, food and all materials are for free. There is participation fee of 20€. This participation fee will be deducted from your travel costs. In Germany all major credit and debit cards are accepted. However, Osterholz-Scharmbeck is really small place and there might not be many ATMs. In the venue no cards are accepted so make sure that you have some cash with you when you need something from the shop or some drinks. Make sure that you bring warm clothes. We are in North Germany, close to the North Sea and it is cold and windy. The temperature in the time of the project should be between 6 and 16 degrees Celsius, although when it’s sunny might come to 20. We will also have outdoor activities, where some simulations will be held outside, so make sure that you bring warm clothes for outside. Every person who takes part in an Eramus+ Youth in Action project is entitled to receive a Youthpass certificate, which describes the non-formal and informal learning experience and outcomes acquired during the project. Working with Youthpass reinforces learning within the Erasmus+ Youth in Action projects and enhances the quality of the projects. You will receive your Youthpass. Should you have any questions regarding the programme or how to prepare best, please do not hesitate to contact us. Looking forward to meeting all of you soon!!! 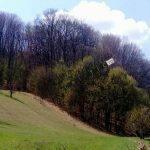 A apărut suplimentul literar al revistei MAGAZIN CRITIC, numărul 58! 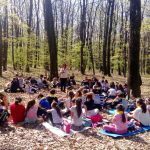 EDIȚIE ÎNGRIJITĂ DE FEDERAȚIA “EURO EDUCATION”!